Excellent information, and TONS of examples. I'd consider this a starter reference book at which point you'd go more in depth elsewhere. The information is organized geographically and chronologically but can read a bit like a list of names paragraph after paragraph. Eh...If you're looking for very, very brief snippets of information this is for you; it's a good reference book.I enjoyed the longer bits of information and wish that Jones would have just selected maybe 5 great women warriors or groups from each geographical area rather than stuffing dozens of them into one section. And seriously... ONE paragraph to Queen Elizabeth I of England? Yeah, she may have really only been involved as a "warrior" during the Spanish Armada but she gave one of her best speeches during it! And TWO paragraphs for the Vikings??? WHAT!? Viking women has some of the most freedoms of women during their time and yes, they were shield maidens but maybe describe that a little more? Props for a more detailed look at Grace O'Malley (maybe a page). 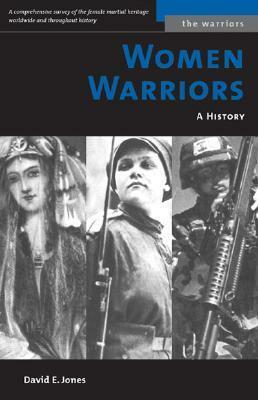 Amazing that I really had no idea what an ancient, common phenomenon women in the military is. Entire all-female battalions, in modern Europe. Something in me is a little shocked by the idea, but my worldview will adapt.But the book itself was no more than a string of anecdotes. Some interesting and told in detail over a few pages, others given only a couple of lines. Rather tedious to read; I would have liked some analysis, statistics, drawing together of threads. And I wish his sources had been more accessible from the main text. Best book of it's kind. Fascinating telling of history.